It’s official - I am now counting down the days until vacay-time and can’t wait to hit a golden, sandy beach! My little one V loves long days on the beach and we can often be found playing games and dipping in and out of the sea throughout the day when on holiday. However one of my pet peeves when spending a day frolicking by the seal is sand - sand and I have a kinda love/hate relationship - I love the feel of it beneath my feet and one of my favourite things to do on holiday is to watch the sunset on the beach, however, I hate how everything in your bag ends up covered in sand – especially when you have little ones who seem to have a knack for getting sand everywhere! So when Austrailian brand Tesalate kindly sent me two of their sand repelling towels for me and V to use on our holidays my beach-tote packing certainly stepped up a notch! Tesalate towels come in 30 variations and their 2018 collection will keep you totally on trend. 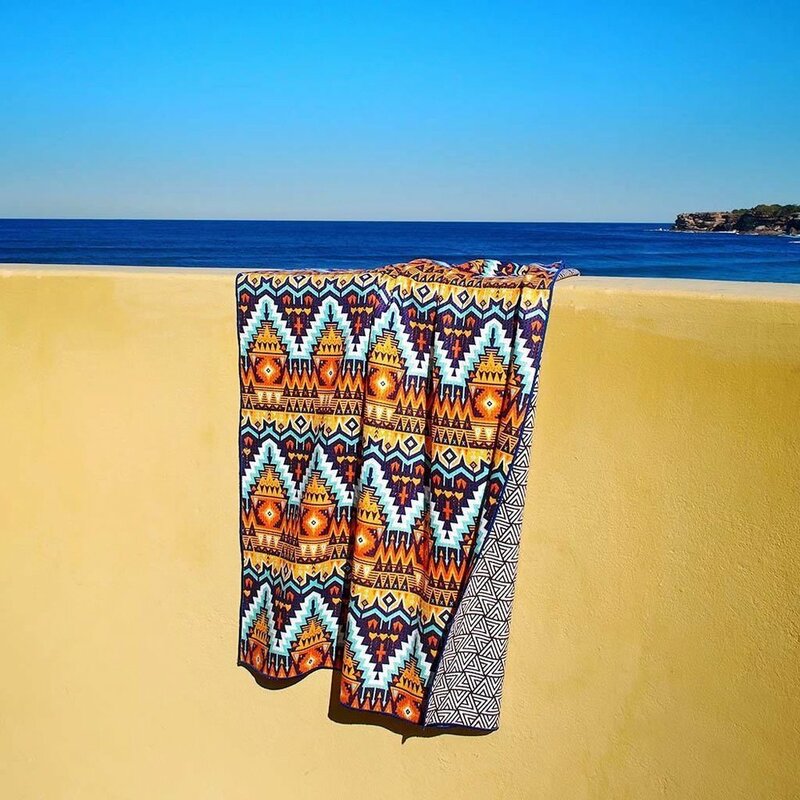 They’re loaded with vibrant prints and gorgeous patterns, and look fab spread across the sand, rolled up in a basket bag or draped over a sunbed. Not only do they look the part, the other thing that makes Tesalate completely-irresistible is the AbsorbLite microfibre which means sand easily slides off the towel, making them perfect for everyone - even the most active of kids! Oh and if that wasn’t enough, they are also fast-drying too and dry faster than a regular towel (although each towel is still able to absorb one litre of water, meaning no more wet bags or car seats on the journey home - yay!). For fabric care you can either tumble dry on low or do a cold machine wash - without the risk of fading. As I pack for half term holidays with Valentina, I am eagerly awaiting the arrival of some magic at one of my fave kitsch stores, Kikkerland. Their latest product, a travel pillow which folds away to a unicorn cuddly, is an awesome answer to nervous travellers who need to add a sprinkling of magic dust to a trip away. This handsome, huggable travel companion is so irresistibly squidgy, he makes the perfect placatory piece for perfect for nervous flyers. The grab-and-go, lightweight unicorn plushie *magically* transforms into unashamedly camp rainbow neck-pillow, when called into action. Suitable for both kids and fun-loving adults, the Unicorn Zip & Flip Pillow makes every journey a magical one. Trains, planes or automobiles, you’ll be forever graced a sublime slumber with the pillow, allowing you to arrive at your destination as fresh as a daisy; which is surely as good as any pot of gold. Telling people that you’re off to Ibiza for the weekend seems to conjure up lots of presumptions and pre-conceived ideas as to what you might be up to, in my experience. But although the Isla Blanca may be the land of the all-night nightclub with a hedonistic history, I personally prefer the hippie history of the island and the chilled vibe which exists in many parts (thankfully) as yet undiscovered by the disco divas. On this trip, shared with four forty-somethings, we checked into the super smart OD Talamanca Hotel, which is located six miles/10km from the airport on a quiet bay close to Ibiza Town. It is an elegant refuge from the non-stop party atmosphere elsewhere and the impressive first impressions included a tight attention to detail in everything - from the design (interior and exterior) to the wonderfully accommodating and friendly staff as well as a modern menu and creative cocktails. Designed by Rahola Vidal architects and the interior designer Mayte Matutes, I totally loved the mix of mid-century and modern. Dry stone walls and sauna-like wood feature heavily outdoors around the pool area, with white walls and large windows throughout the bedroom spaces in the main buildings. Fans of designer chairs will be in heaven with repro Eames, Jacobson and Wegner styles, to name just a few. For me, the walk-in wardrobes of the suites were an incentive to actually unpack – which I don’t always get round to on weekend trips – and the wide, comfortable beds made for easy, relaxing slumbers, way beyond what I’d get on a busy weeknight at home (which is a terribly un-Ibiza thing to say I imagine). Location, Location: In terms of location, the hotel is at the eastern end of Talamanca Bay, which is about a 5-10min taxi ride or a 30-minute walk east of Ibiza Town. You can walk down to the sea in a couple of minutes. It’s not the prettiest beach in the world, but it is nice for a swim with shallow waters underfoot and soft sand. We loved the Bodega tapas bar down by the beach – I had been there before back in 2014 and it hadn’t changed, with its hipster vibe plus really tasty tapas at very reasonable prices; perfect for a late night flight arrival. The the ‘secret find’ of the amazing local Fish Shack restaurant is only about 10 minutes up the beach path also. If you’re partying at Pacha or Ushuaia it takes about 20mins/25 euro to get there by taxi. Likewise, it cost us £25 euro to get to our fave beach club El Chiringuito by private car. Rooms: All bedrooms and suites, across both main buildings, have at least a partial sea view of Talamanca bay and the Dalt Vila (old part) of Ibiza Town beyond. I loved our room’s pool view and balcony as well as the walk in wardrobe and open bathroom with its dual basins and a rain shower, plus some zingy citrus fragranced products. Super Staff: The staff from the door to floor reminded me of those trained by the Starwood Group. They were all super polished like the beauties and babes of the Hudson in NYC or the W Barcelona, but with extra (genuine) Mediterranean charm and an eagerness to please. Even the gorgeously Nordic looking blonde female DJ spinning tunes in the lobby on Sunday afternoon was smiley and welcoming in a warm and friendly way. A Tavola: The kitchen is open all day which helps in Ibiza when you might well be keeping odd hours. Mediterranean-Asian fusion dishes include tuna tataki and wagyu burgers. Room service includes tempting options such as a toasted aubergine sandwich with burrata and rocket. Breakfast – my favourite meal of the day - is available from 8am until midday with an excellent buffet and a menu with lots of healthy options including eggs pretty much any way you like, plus smoothies and bowls with every on-trend ingredient imaginable. Who stays there? Well, when we stayed there were groups of cool baristas from Italy, sponsored by Red Bull. We also met some Norwegian bankers and a DJ/talent agent plus one or two musicians. It doesn’t seem overly family-orientated, but there were a few cool Euro families with beautiful kids lounging by the pool and eating quietly at breakfast. No screaming tantrums on my watch anyway. My only disappointment? No gym or spa, but I am told these are en route. And that’s good, because I’ll be back. My partner and I love fine wines and good food. And we are pretty heavy on 'stuff', so for Christmas gifts I always like to treat my better half to an experience - ideally involving some culture, food, physical activity and travel. After previous tasting trips to Champagne and cooking courses in Paris, I decided a truffle hunt was the way to go this past Christmas - and it didn't disappoint. I came across Las Pastras on TripAdvisor and booked, then rebooked and chopped & changed 3 times due to work commitments. Thankfully our hosts were accommodating and flexible (or maybe just used to people like us) and we eventually made it to Provence on the last weekend for truffle hunting towards the end of February. There was a mistral wind blowing despite some sunshine, so thankfully we were well wrapped up. We knew we were going to someone's home and that the home was in a rural environment, so others making the trip should bear this in mind. It's not luxury, in the full five star sense, but it is truly lovely :-) Johann met us up his lane after our Google Maps app took us exactly to his almost secret home location. We heard the stories of why it is secret - and I don't want to spoil the visit for anyone else who comes, but think Peter Mayle-like stories of local suspicion and conspiracy around such simple things as food (albeit a very expensive foodstuff in terms of the fruits of this precious 'terre'). We then met the dogs - Madeline the elder female was definitely the boss, and we followed their noses to the roots of the oaks to seek out and find the precious cargo of what was almost 1kg of truffles. After 3 hours of walking, talking and learning about birds, bees, organic farming and the Provençal way of life, we got down to some eating and Champagne quaffing alongside truffles with cheese, truffles with bread and butter and much more! Thankfully, there are not volumes and tomes of info like a wine trip, so I don’t think we’ll forget the info like we have done after visiting wine regions, because truffle farming is a lot about skill, but even more so about a lucky set of natural circumstances. Plus, Johann really welcomed questions of all types - and I was full of them! This trip was a pleasure - and we left owning (or adopting) an oak tree with the promise of an annual batch of our own truffles for dinner parties at home! It was a wonderful learning experience and not one we’ll forget quickly. Later that night we ate in a delicious Michelin star restaurant but the next day we burned a good bit of it all off with a dynamic trek to the summit of Mont Sainte Victoire... This is most definitely a trip for foodies and those willing to learn.